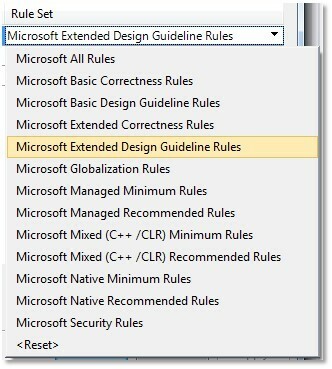 You can use the Microsoft Managed Recommended Rules rule set to focus on the most critical problems in your managed code, including potential security holes, application crashes, and other important logic and design errors. You should include this rule set in any custom rule set that you create for your projects. I like this rule set, but it’s not enough for me. I suggest using Microsoft’s Basic Design Guideline Rules rule set. The MSDN description suggests, “You should include this rule set if your project includes library code or if you want to enforce best practices for code that is easy to maintain.” Best practices for code that is easy to maintain? Who doesn’t want that!? I can tell I’ve sold you on this rule set, and now you’re wondering how to actually use it. Don’t worry, it’s easy! That’s it! Now, when you run Code Analysis, it will use the selected rule set.